In this article about the Customizer, we'll cover the various options provided for the header settings. Let's explore these options one by one and see how the effect our website. Notice now how our menu is fixed to the top, so fixed top, when we scroll shows the menu still, perfect if you want to make navigation easier for the users of your site, to not have to keep scrolling to access the menu. In the same section, we can also edit the spacing for the logo bar, top and bottom, the value entered in these boxes, effects the padding top and bottom. That means if you want to remove that white space, you can just lower the value as needed, normally you'd have around 5 entered, just so it doesn't sit right below the browser bar of the end user. As we can see, it's added some white space below the logo, which has pushed the nav/menu bar down. This allows us to set the height of the Navbar itself, you'll want this normally to be between 40 and 60, otherwise, there's going to be a very squashed look unless you add additional CSS. Notice now how we have the additional white space under our nav item? This is all part of the navbar and can easily be changed with that one option, the higher the value entered, the more whitespace there will be. The next option you'll see is for the Logo font-color. If you don't have logo font color, set to on, you won't see this option and won't be able to set the logo font color from the customizer. The next option you see is for the Logo Font size, this is a px value. This is a slider based setting, allowing you to set the letter spacing of the logo in a em rather than PX value, the em value of the slider can be between -0.15em to 0.5em. This has a value of either On or Off, with setting the value to on, it forces our logo to be uppercase, even if we entered lowercase text, with it set to Off, it'll show the logo as you entered it. The next option is the logo, this a simple option and just let's you select a logo from the media library, or upload a new image to the media library to use as your logo. Setting that would replace your site title, so the logo would show in place of the site title, in the navigation area. 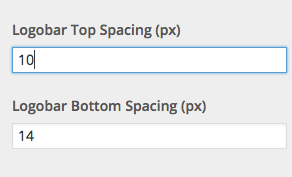 The next option is for the Navbar Top Logo alignment in a PX value. The next options are all related to the Navbar text and font. As covered further up, if Custom fonts is set to Off, this option won't be available to set. The next option you'll see is called Navbar Links, this has a option of a color selector, to set what color you want your navbar links to be. The next option is for the Navbar Letter Spacing, this is the option for setting how much space in a px value is between each letter in the navbar. 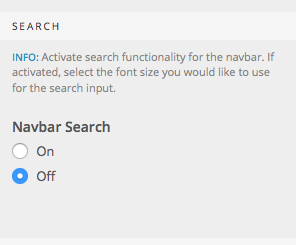 It has a on and off value, if it's set On, it forces uppercase characters for all Navbar text, if it's set to Off the Navbar text will show exactly how you entered it. 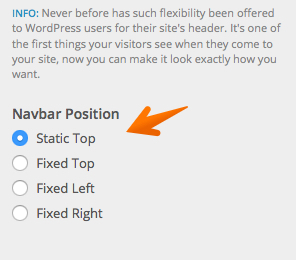 The next option is for the Navbar Top link alignment and Navbar Top link spacing, both values are in PX. If you then click the search icon, you'll see that a overlay comes up, to allow you to type and enter something for your search. 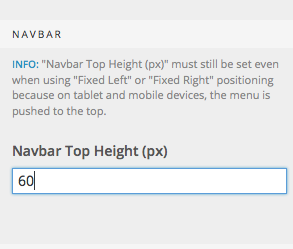 This sets the alignment of the mobile navbar button in a PX value. It's currently empty, as we don't have any header widgets set. These can be set in wp-admin > Appearance > Widgets. As you can see our top bar shows above the logo area and by default contains the social icons we set in the earlier article here. This is perfect for entering something like a phone number or other contact details for your business. Traditionally, breadcrumbs are seen as useful for your users to navigate the site and know where they are, but with breadcrumbs it gives a cleaner look, overall it's down to personal preference. Congrats! Throughout this article, you've learnt how to use the various header options enabled in the Customizer. How to make sticky footer menu, just like in the demo?